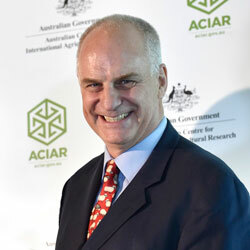 Andrew is Chief Executive Officer of the Australian Centre for International Agricultural Research (ACIAR). Through a series of influential national roles, Andrew has been at the leading edge of sustainable agriculture and natural resource management science and policy in Australia for more than 30 years. He has long been recognised for his visionary work on the relationship between people and land, firstly in developing the concept of whole farm planning, and then through Landcare, as Australia’s first National Landcare Facilitator. Andrew was previously Director of the Research Institute for the Environment and Livelihoods (RIEL) at Charles Darwin University, CEO of Land & Water Australia, Managing Director of Triple Helix Consulting, and Senior Executive in the Australian Government environment portfolio. He is an adjunct Professorial Fellow at Charles Darwin University, a Visiting Fellow at the Australian National University’s Fenner School and a Commissioner with the IUCN’s World Commission on Protected Areas. Andrew has written widely on landcare, knowledge management and sustainability issues for policy, science and general audiences. With training in forestry, rural sociology and knowledge systems from the University of Melbourne, and Wageningen Agricultural University in The Netherlands, his research interests (reflected in more than 100 publications) span the interactions between climate, water, energy and agrifood systems, and the interface between knowledge, science and policy. Andrew maintains an involvement in his family farm (forestry, cropping and sheep) in western Victoria, where his family has been farming since the 1860s. How does agriculture respond to the nutrition challenge? In the ‘good old days’ of agricultural research from the middle of last century, the objective was clear – increase food and fibre production to feed and clothe rapidly growing human populations. That’s no longer the case. Agricultural research and policy now confront new challenges of unprecedented scale and complexity: climate change and nutrition. With fewer than one third of the global population on a healthy diet, what is the role of agriculture? It’s no longer just about producing more food, more efficiently and more sustainably, but producing more and healthier food, efficiently and sustainably, and ensuring that it is distributed equitably. Systemically, agriculture is obviously part of the food system, but it is also central to the health system, with climate change as a risk multiplier for both. Agriculture and health have yet to come to grips with this 21st century reality, in either science or policy. This brief overview presentation will discuss this dilemma through the lens of agricultural research. We are still shaping the research agenda for nutrition in agriculture. It is clear that we will need to develop new platforms for collaboration cross the food system, between the food and health systems, and between the public and private sectors. In doing so, the skills we have developed in brokering durable partnerships, the practice of involving end-users in the process of scientific inquiry, and the principle of developing enduring capabilities in science and policy in the countries with which we partner, remain more relevant than ever.